Baby cat Loulou got pregnant before it turned one year old. But even at this young age, it is a wonderful mother. When I got to bed that special night, Loulou slipped under my cover. It was rather hot there and Loulou realized after some minutes that this wasn’t a good place to give birth to its babies. I made it a nest on the matrass beside my bed and felt asleep very quickly. Excited by this little wonder happening in my bedroom, we three observed Loulou and its two charming creatures. We thought two babies would be enough. So we could keep them both. But suddenly, Loulou laid down again. It sounded like a fart when a black ball rapidly got out of its body. Loulou took of the bag of waters and dried the third baby by licking it softly. Okay, three babies would be enough, we thought. But after a few minutes, number four slipped out of its mother, very quietly compared to number three. Oh, dear! We’re so proud of our cat mother. Loulou did all as I had read before. It ate all four placentas. “It looks like a dark brown slug”, Little Boy said which was a very precise description. It was 1.30 a.m. 10-year-old Boy and me, we two were not tired at all. “I go to bed now,” Big Boy said, “and I’ll look at the details in the morning!” That was a clear statement by my 12-year-old. The exciting adventure with our cat family is 10 days old today. Nature is gracious to us. 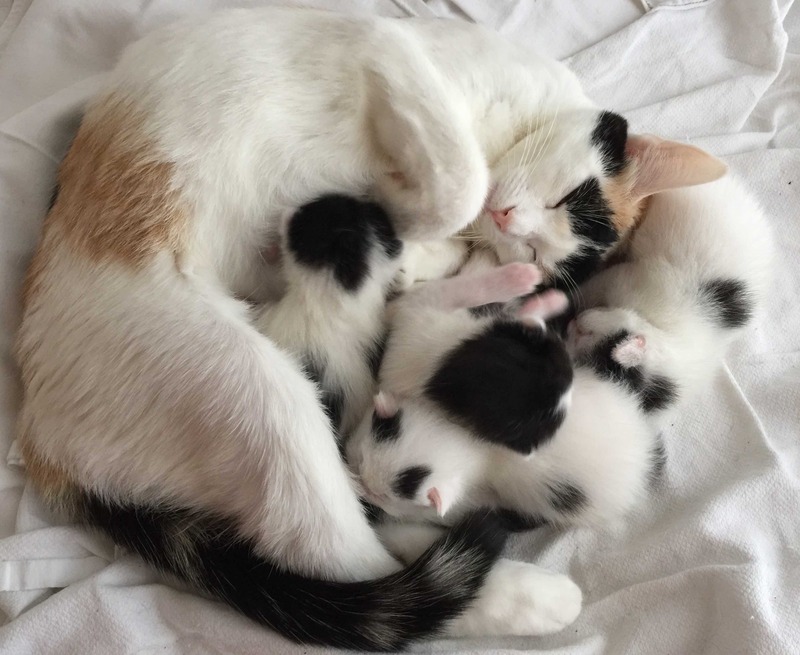 All four kittens and its mother are healthy, drinking, sleeping, drinking, sleeping, getting washed by its mother, smelling wonderfully like newborn, peeping from time to time when they cannot find a free teat. We could spend hours and hours by watching this small miracle.